Eyes are important indicators of overall health, and comprehensive eye care goes beyond a prescription for glasses or contact lenses. At the Optometric office of Dr. Bill Morrison, we take the time to get to know you, your eye care history, and your vision needs. In 1915, Dr. J.C. Morrison Sr. opened the practice in Gainesville. Following in his father’s footsteps was Dr. J.C. Morrison Jr in 1949. 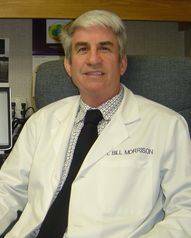 Continuing on the family practice in 1975, Dr. Bill Morrison began seeing patients in the same practice as his grandfather and father. The Morrison family is honored to have been working with the residents of Gainesville to provide expert care and advice for more than a 100 years! Dr. Morrison’s office feels strongly about helping others in the community. As members of Free Chapel church he and his wife serve on the Altar Team and help with the School of Discipleship and Bible College. They are currently providing housing for 2 Bible College students, thus helping develop future Christian leaders for the community. At his office Dr. Morrison serves people from all walks of life and provides free eye care when their are needs and persons cannot provide for themselves.